It’s all food to a black bear! A bear’s strongest sense is smell. They can pick up a scent from over a mile away! That is more than seven times better than a bloodhound. Food and food odors attract bears, so don’t reward them with easily available food, liquids or garbage. 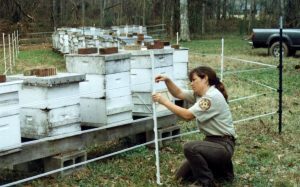 Take the BearWise Quiz: Is it bear-resistant or not? Visit the Keep Bears Out page to view a variety of solutions for securing garbage and recycling like this one. If you and your neighbors keep your food and garbage secure from bears, you will go a long way toward keeping bears in the wild and out of your neighborhood. We urge you to follow this list of simple precautions. Human foods, from picnic lunches to spilled snacks on the ground, can easily attract bears. Never leave human foods outside unattended. Pick up all leftovers and bring them inside. For bear-resistant food storage options, see Keep Bears Out. 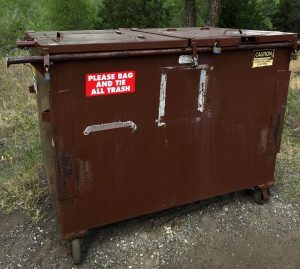 Garbage and recycling should be stored where bears can’t smell or access to it: either in a bear-resistant container or inside a bear-resistant building. For bear-resistant garbage and recycling options, see Keep Bears Out. Haul garbage and recycling to an approved disposal site as often as possible, but at least once a week to avoid buildup of odors. Garbage and recycling pick-up? If you have garbage pick-up once or twice a week, put your cans on the curb the morning of pick-up, never the night before. Composting is not recommended in areas where bear visits are frequent, because the odors attract bears. If you do compost, use an electric fence or enclosed, bear-resistant composter. Don’t put meat, grease, or bones in a compost pile. See How to Compost in Bear Country for tips. Anything that attracts dogs or raccoons will attract bears, too! What is a secure container, and where can I get one? Bears are extremely strong with deft claws and sharp teeth. If they have time (like all night long…), and motivation (hunger! ), they can get into anything not specifically designed to keep them out. 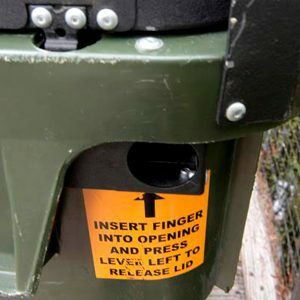 A bear-resistant trash can or dumpster looks just like the ones you know, but has been reinforced with locks or a push-to-open latching system. Bear-resistant dumpster lids must also be made of metal, not plastic! 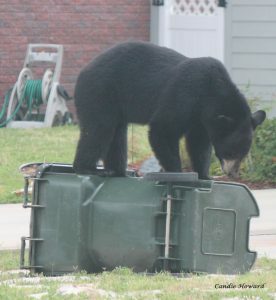 If your waste service provider does not offer bear-resistant trash cans, you can purchase your own wildlife-resistant container or dumpster. Before purchasing a bear-resistant container, be sure to check with your waste service provider to ensure they will service it. The up-front cost is worth it when considering replacement of ruined garbage cans and time spent picking up scattered trash. Your action on behalf of bears will make a difference for bears and your community. Some homemade containers and barriers can be made with items you can purchase from local hardware stores. Others can be purchased online. Contact your local fish and game officer for recommendations. Helping people live responsibly with black bears.